EFO's Credit Card Sized Mini Bluetooth Wireless Keyboard | OhGizmo! Those of you who’ve made the upgrade to a touch screen smartphone but pine for a physical keyboard can now enjoy the best of both worlds without your pockets bursting at the seams. 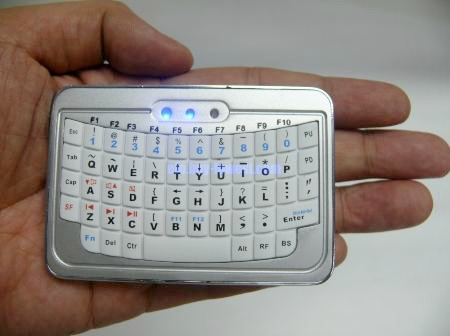 Somewhere someone is diligently working to make Bluetooth keyboards as small as they can possibly be, and the latest fruits of their labors is this credit card sized model from EFO. Now it looks like someone has actually just pryed the keypad off of a Blackberry, but it’s a fully working QWERTY keyboard complete with F1-F12 function keys, CTRL, ALT, DEL, multimedia playback buttons and it’s been tested with both the iPad and iPhone. I’m not sure what kind of battery it’s sporting or how long it works before needing a refresh, but for a limited time you can order one for just $32 before it goes back to its regular non-introductory price of $40 in September. Umm i doubt i would use that with my iphone..it'll be kinda a hassle switching back and forth u know looking at the message then responding back with the keyboard, while u can just use the touch keyboard on the phone, then again most people dont like the keyboard on the iphone. If u like pressing buttons, then Go for it! I personally like pressing buttons instead of using touch screen … It depends on what you are used too. I use a Palm bluetooth full keyboard. It folds in half for easy transportation in my backpack. Very cool. I use a Palm full-size bluetooth keyboard with my iPhone. It folds in two for easy transport in my backpack. I really like it when I need to type a lot. Otherwise, I just use the onboard touchscreen keyboard.